IT Business Efficiency: To help ensure application compatibility during Intel’s enterprise-wide migration from Microsoft Windows XP to Microsoft Windows 7, Intel IT implemented a carefully controlled workflow in one common test environment. So far, out of more than 1,000 applications tested, we have encountered fewer than 10 that could not be remediated within our migration timeframe using standard methods. 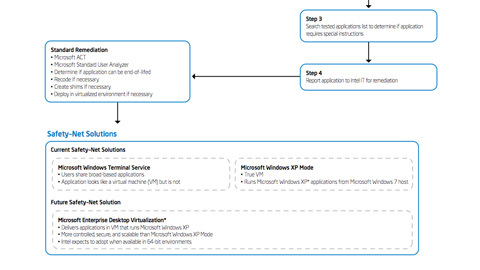 Read how Intel IT is managing a successful migration to Microsoft Windows 7.